Researchers from the University of Warwick have devised an innovative and inexpensive method for detecting harmful microplastics in oceans. 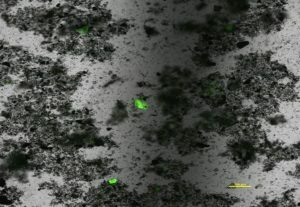 Led by Gabriel Erni-Cassola and Dr. Joseph A. Christie-Oleza from Warwick’s School of Life Sciences, the researchers used fluorescent dye to detect the smaller fraction of microplastics – many as small as 20 micrometers. According to the researchers, the dye specifically binds to plastic particles, and renders them easily visible under a fluorescence microscope. This allows scientists to distinguish microplastics amongst other natural materials and makes it easy to accurately quantify them. The researchers first tested the feasibility of their dye on samples taken from surface seawater and beach sand along the English coast of Plymouth. After extracting the microplastics from these environmental samples, they applied their method and were able to quantify the smaller fraction of microplastics effectively. The researchers detected a much larger amount of small microplastics (smaller than 1 mm) than was previously estimated – and significantly more than would have been identified previously with traditional methods. The researchers also discovered that the greatest abundance of microplastics of this small size was polypropylene, a common polymer which is used in packaging and food containers. Microplastics are the most prevalent type of marine debris in our oceans, and their impact or potential harm to aquatic life is not yet fully understood. Previous reports suggest that the amount of plastic waste found in the oceans only amounts to 1% of what was estimated, so new methods like Warwick’s are desperately needed to find and identify the missing 99% of ‘lost’ plastic waste in our oceans.